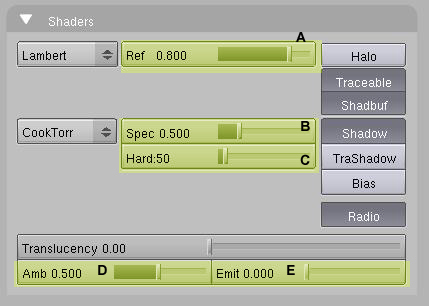 Blender materials for the game engine redirect Tex-face options over to blenders material panel. Which allows you to set multiple materials on an object and multiple textures to that material. 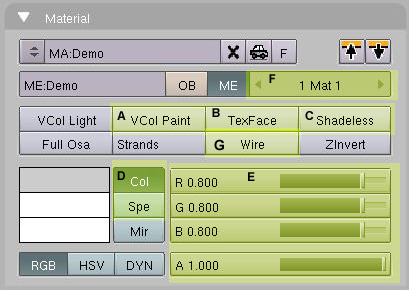 Sixteen materials can be assigned to one mesh. Three textures are available for each material assigned to the mesh. 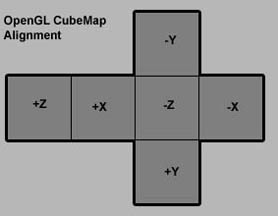 Regular UV-mapped models will still use the old game engine method. If 1).the mesh has no material actively assigned to it. 2). the material on the object is set with the option Tex-face. Use mesh vertex colors over the (default) material color. Use the meshes face texture assigned in face select mode (f) . This will count as your first texture unit. Specify which color value (E) will apply to. G. Draw this material in wire frame-mode. Sets the amount of reflection, in calculating the lit material's diffuse color. B. Sets the amount of specular, in calculating the lit material's specular color. C. Third image unit. This might not be available if your graphics card only supports two texture units. Two is the minimum, requirement. Note: All options here are per image unit. B. Invert blending for this texture. C. Use Mix, Add Subtract, Multiply and Screen to blend texture. 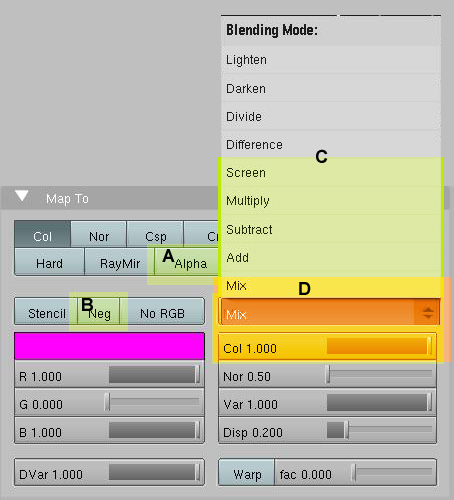 If Mix is the blend mode: use the color slider to adjust the amount 1 = the texture only, 0= the previous texture(if no previous texture, the base color)only. 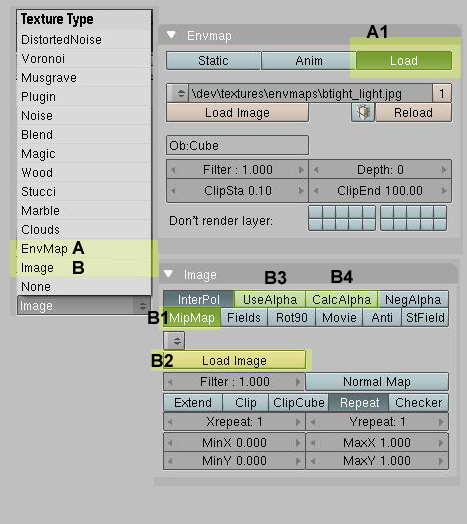 Ex: setup a scene to render a blender EnvMap with CubeRes at power of two (128, 256, 512) then use the Save EnvMap option. A1. Load a previously calculated EnvMap. This will be the only option that works at runtime. B, Use a normal image. To have more than one material per mesh, you have a couple of options. The first is to apply materials to separate meshes then join them together. The second option is to use the panel in the Edit Buttons. Create the number of materials you want for the mesh(New). 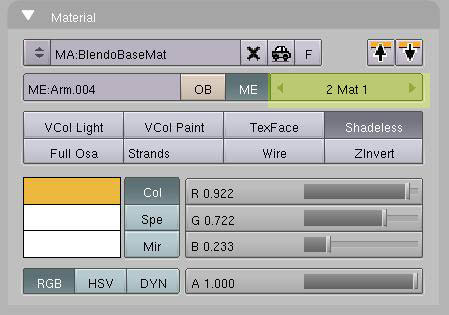 Select the Mat number and the faces on the mesh you want for the material then hit Assign. Check with your graphics card manufacturer to see if GLSL is supported. Sets the shaders strings. One vertex program source and one fragment programs source Value apply sets the material to use the shader, 1 or 0.
delSource() Deletes the shader, If the shader is to be used again you will need to call setSource again. getVertexProg() Returns a python string of the vertex program. getFragmentProg() Returns a python string of the fragment program. setNumberOfPasses(num) Sets the number of times the material that owns this shader is rendered. isValid() Will return true if the shader has been set and no error has occurred, false otherwise. validate() A check to see if the shader is a valid GLSL shader. setUniform1f(name, f) Sets one float value for name. setUniform2f(name, f0, f1) Sets two float values for name. setUniform3f(name, f0,f1,f2) Sets three float values for name. setUniform4f(name, f0,f1,f2, f3) Sets four float values for name. setUniform1i(name, i) Sets one int value for name. setUniform2i(name, i0,i1) Sets two int values for name. setUniform3i(name, i0,i1,f2) Sets three int values for name. setUniform4i(name, i0,i1,f2, f3) Sets four int values for name. setUniformfv(name, list) Sets float lists of length 2, 3, or 4 (vec2, vec3, vec4). setUniformiv(name, list) Sets int lists of length 2, 3, or 4 (vec2, vec3, vec4). setUniformMatrix4(name, mat, transp=true) Sets a 4x4 matrix (mat4) transpose matrix for OpenGL style. setUniformMatrix3(name, mat, transp=true) Sets a 3x3 matrix (mat3) transpose matrix for OpenGL style. setSampler(name, index) Sets a sampler2D or samplerCube at index. index is the order of the texture in the material panel, otherwise index is 0. Start by opening base.blend in the tutorial directory. The blend file contains the Blendo model we will be working with. On layer one will be the base model and Blendo's eye lids. Layer two contains the eye. Select the base model and add a new material. Set the material color to an orange and press the Shadeless button. Now select each eye lid, then select the base model. Join them with Ctrl+j. The base model's material should now be on the each eye lid. Join the three parts together and add a material to the object with, Shadeless and VCol-Paint pressed. Move the eye to layer one. Select the eye then the Blendo mesh and join the two. You should now have one mesh with two materials assigned to it, the Blendo mesh is at index1 and the eye is at index2. In python the indexes will be 0,1. Create two empties some where in layer one. One of them will be our light and the other will hold the shader script. Start with the vertex shader. We are going to need a uniform variable holding our light position and, three varying variables to pass to the fragment shader. The first is the vector from vertex to light, the second will hold the surface normal, and the last will hold the material color. Now for the fragment shader. Copy the varying variables from the vertex shader to the fragment shader. We need to normalize the light vector and the normal vector. A color variable is also needed that we can modify. Some temporary variables will do the trick. Calculate the dot product between the light vector and the normal and clamp it in the range of 0,1. Now create some cells based on the ndotl value. The lower the value is, multiply the material color by a smaller value. We will apply the same shader to the eye. Except, because the VCol-Paint button is set, the material_color (gl_Color) will be the vertex color assigned to the mesh. If you want a different color Blendo just change the material color. 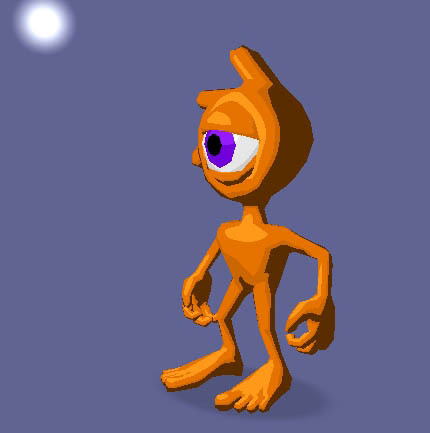 In the tutorial directory is ToonShader.py which you can use in your own projects. 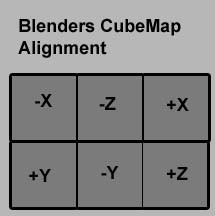 To run these changes in the BlenderPlayer, they need to be enabled. If it is a runtime.